Door prizes, promotions, refreshments, and holiday merchandise will be showcased during Sebring’s downtown Christmas Open House this Friday, Nov. 9th from 5:00-7:00 p.m., and Saturday, Nov. 10th from 9:00 a.m.-3:00 p.m. The Sebring Business Association is sponsoring and supporting the Christmas Open House. Participating businesses, as well as other SBA companies, have collected door prizes totaling more than $750. Those companies and organizations who have donated door prizes are the American Legion post 76, Apex Control Systems, Ashton’s 5 & 10, Brickhouse Bar & Grill, Community Caregivers, Copeland Oaks, Designs by Me, El Sabor Restaurant, Gednetz-Ruzek & Brown, General Commercial Corp., Heritage Oaks, JP’s/Gromolls, Leonard Hardware, Love it Again Prim & Vintage, Lowbrow Tattoo, Royal Star Diner, Royal Star Rustic Treasures, Salem Repulic Rubber, Sebring Historical Society, Sebring Mansion & Spa, Sebring Trophy, and Sweet Bunz Bakery. Shoppers will receive an entry in the drawing with every purchase made at a participating open house. Drawings will be held on Tuesday, Nov. 13th and winners will be notified. “The annual Christmas Open House is an exciting and unique opportunity for many of the downtown merchants to show their products, including great food, said Leonard Hardware owner Susan Risbeck-Sanor. It’s also a time when our community can show it’s support for small, local businesses which, in turn, helps to boost our local economy.” Sanor also urges Open House Shoppers to visit downtown restaurants during the special weekend. Other upcoming events include Small Business Saturday on November 24th. And on Saturday, Dec 1st, the SBA and Gednetz-Ruzek- Brown Funeral Home will co-sponsor Sebring’s very first live Christmas tree lighting, followed by the Grand Parade down 15th Street, and a Winter Wonderland party with Santa in the community room at the funeral home. 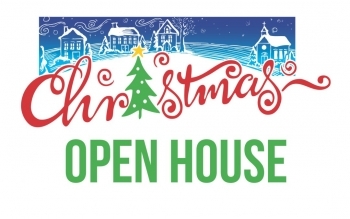 To learn more about the Sebring downtown Christmas Open House, or the other holiday events, phone Sanor at 330-938-6329 or Sam Barnhouse at 330-277-3091 or visit “Re-Imagine Sebring, Ohio” on Facebook.